Introduction Malnutrition remains underdetected, undertreated and often overlooked by those working with older people in primary care in the UK. A new procedure for screening and treatment of malnutrition is currently being implemented by a large National Health Service (NHS) trust in England, incorporating a programme of training for staff working within Integrated Community Teams and Older People’s Mental Health teams. Running in parallel, the Implementing Nutrition Screening in Community Care for Older People process evaluation study explores factors that may promote or inhibit its implementation and longer term embedding in routine care, with the aim of optimising sustainability and scalability. Methods and analysis Implementation will be assessed through observation of staff within a single area of the trust, in addition to the procedure development and delivery group (PDDG). Data collection will occur at three observation points: prior to implementation of training, baseline (T0); 2 months following training (T1); and 8 months following training (T2). Observation points will consist of a survey and follow-up semistructured telephone interview with staff. Investigation of the PDDG will involve: observations of discussions around development of the procedure; semistructured telephone interviews prior to implementation, and at 6 months following implementation. Quantitative data will be described using frequency tables reporting by team type, healthcare provider role group, and total study sample (Wilcoxon rank-sum and Wilcoxon signed-rank tests may also be conducted if appropriate. Audio and transcription data will be analysed using Nomarlization Process Theory as a framework for deductive thematic analysis (using the NVIVO CAQDAS software package). Ethics and dissemination Ethical approval for the study has been granted through institutional ethical review (Bournemouth University); NHS Research Ethics committee approval was not required. Dissemination will occur through presentations to academic and practitioner audiences and publication results in peer-reviewed academic journals. Prospective investigation of factors promoting or inhibiting implementation of service development, allowing for feedback to inform ongoing development of the programme. One of the first process evaluations conducted on implementation of nutritional care in community settings. Integrated use of mixed methods to provide reproducible measures at each observation point (quantitative, survey), and explore processes underpinning them (qualitative, semistructured telephone interviews). Investigation is guided by Normalization Process Theory, which informs study design by serving as a sensitising framework for identifying potential areas relevant to implementation. A limitation of the study is lack of observation of new procedures applied in situ, meaning that processes relating to implementation can only be explored retrospectively through interviews. Malnutrition remains underdetected, undertreated and under-resourced, and is often overlooked by those working with and for older people in the community.12 While the importance of screening for malnutrition has been emphasised by expert groups,8 9 13 nutritional care is generally not commissioned, and the responsibility for implementation often falls between many health and social care roles. In October 2015, National Health Service (NHS) England published new guidance for service commissioners,14 to address these issues and develop strategies to make good nutritional care a high priority. It is vital to identify older people who are undernourished, as well as those at risk of malnutrition, at an early stage. A validated screening tool, such as the Malnutrition Universal Screening Tool (‘MUST’) should be used,13 endorsed by the National Institute for Health and Care Excellence (NICE)9 and supported by the Royal College of Nursing and the British Dietetic Association. The aim of screening is to ensure that patients receive a more comprehensive nutritional assessment and appropriate referral for nutritional support. Therefore, timely identification of older people considered at risk for malnutrition as a result of screening should lead to appropriate action and management, and thus prevent further deterioration in nutritional status. As part of service development in this area, community nursing and allied health professionals working within community teams (covering physical and mental health services, respectively) are currently undertaking development and implementation of a new procedure for screening and treatment of malnutrition in older people (see online supplementary file 1). fourth, the new procedure emphasises that staff at all roles and grades who provide community care to older people have responsibility for malnutrition screening and delivery of appropriate treatment. As part of introduction of the new procedure, staff will be provided with training involving a 1-hour session delivered by a dietitian. A total of 12 sessions will be offered (four sessions to staff in each of the three teams within the business unit), to enable as many staff as possible to attend. Staff working in community teams will be invited to participate in a 1-hour training session, which will explore practice and knowledge-related issues that may contribute to suboptimal practice in screening and treatment of malnutrition. Effectiveness of training will be assessed through pretraining and post-training knowledge questionnaires, and outcomes data associated with screening and treatment of malnutrition for the teams in which the training has been implemented. This project presents a new research collaboration between Southern Health NHS Foundation Trust, Wessex Academic Health Sciences Network (Wessex AHSN), and Bournemouth University. The aim of the present work is to explore prospectively how the procedure and training is implemented, in order to identify processes that may promote or inhibit embedding of the new procedure as a routine aspect of care (hence the project title: ‘Implementing Nutrition Screening in Community Care for Older People (INSCCOPe)’. It is intended that the study findings will support future developments, scalability, implementation across the trust. This protocol describes a prospective investigation (up to 12 months) aimed at exploring processes promoting and/or inhibiting, implementation and embedding of the new procedure and associated training. Informed by NPT, the project will involve two participant groups: (1) staff within Integrated Community Teams (ICTs) and Older People’s Mental Health Teams (OPMH) who are receiving training on the new procedure and will be embedding it in their practice; (2) members of the procedure development and delivery group (PDDG) (that is, members of staff within Southern Health NHS Foundation Trust who are responsible for taking forward and implementing the new procedure and associated training). Specific questions derived from the NPT framework are given in online additional file 2. Outcomes data relating to success of the intervention (ie, numbers and proportions of target population screened preimplementation and postimplementation, as well as data on treatment activity following a clinically significant MUST score) will be collected by the outcomes arm of the INSCCOPe project, and a summary of these data will be presented in reporting of findings from the process evaluation arm described in this protocol. All ICT/OPMH teams within a single business unit of the trust will be approached at T0, and participants recruited according to the inclusion/exclusion criteria in table 1. Prior to beginning recruitment, data on composition of target population (ie, all healthcare staff in ICT/OPMH teams within the single business unit) by role (eg, community nurse, physiotherapist) and NHS Agenda for Change (AfC) band (the current grading system for staff seniority within in the target population) will be provided by the trust. From this, a quota sampling frame will be derived within which the team will look to recruit the maximum number of participants proportional to the distribution of role and grade characteristics of the target population. PDDG members will also be approached at T0, and recruited according to the inclusion/exclusion criteria in table 2. Exploration of implementation and embedding among ICT/OPMH staff will involve data collection at three time points: baseline (T0 —preimplementation of procedure and training); approximately 2–3 months following completion of training (T1); and approximately 8–9 months following implementation (T2). For ICT/OPMH participants, data collection at each time point will involve completion of a 23-item questionnaire adapted from the NoMad instrument,32 and a follow-up semistructured telephone interview (to be completed by a subsample of participants). PDDG participants will complete a single semistructured telephone interview prior to implementation of the training. Rationale for the methods and study design are now described with reference to Good Reporting of a Mixed Methods Study criteria,34 and summarised in figure 1. Relationship between Integrated Community Teams/Older People’s Mental Health Teams participant questionnaire and semistructured telephone interview data. NPT, Normalisation Process Theory. Prior to an in-person invitation to participate in the study by the researcher (MB), potential participants will be sent an ICT/OPMH participant information sheet (PIS - see online additional file 3a, 3b for PDDG PIS), with details of how to contact the research team with further questions. This will be circulated via email by cascading down through team leads to each of the ICTs. Potential participants will then be approached at an ICT meeting by a member of the research team, at a time agreed with the team lead. The researcher will introduce the study, and answer any outstanding questions from participants. Participants will be informed of their right to withdraw at any stage, without negative consequences for themselves, and without giving a reason. Those wishing to participate in the study will then complete: the agreement form (see online additional file 4A for ICT/OPMH participants; online additional file 4B for PDDG participants); a participant data form (PDF— which collects demographic and contact information—see online additional file 5); and the T0 NoMad instrument (see online additional file 6). This study uses the ‘NoMad’ survey instrument, a 23-item closed questionnaire based on NPT,33 in which participants are asked to evaluate statements relating to specific implementation-related components using a five-/ten-point scale, as our primary data collection method. This instrument has been adapted, in line with author guidance,33 for the INSCCOPe project (see online additional file 6). Use of NoMad allows us to explore issues relating to implementation and compare these outcomes across the different role and team types within the study, as well as exploring change in specific implementation areas over time. Development of the questions will involve piloting with non-dietetic healthcare providers (HCPs) who are involved as members of the PDDG, to explore clarity and face validity of the questions. At T0, questionnaires will be completed at the point of recruitment. At subsequent observation points (T1/T2), questionnaires will be circulated via team leads. Each participant will be given an envelope containing a questionnaire, which will be completed and sealed before returning to the team lead (return envelopes will not contain identifiable information). Participants will be informed by email/text message that the questionnaires are available for completion; 2 weeks thereafter a reminder email/text message will be sent, and completed questionnaires will then be collected by MB after a further week (a 3 week interval is allowed in order to accommodate staff annual leave). 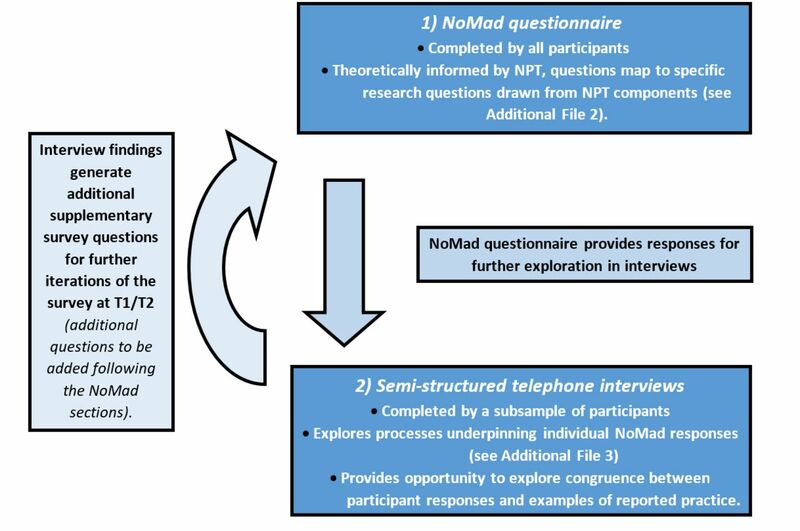 At each time point, all participants will be asked to complete the NoMad instrument, and a subsample of participants (see below) will be invited to participate in a follow-up semistructured telephone interview. In addition to exploring responses to NoMad questions relating to each of the NPT components, incorporation of qualitative interviews offers several benefits. First, exploration of participant experiences can identify factors relevant to implementation that may not appear through the NoMad instrument (eg, how implementation may be affected by relations between specific teams at the local level29). This will allow for iterative development of additional questions (to be added after the items adapted from NoMad) at further time points (ie, interviews at T0 would generate questions to be added to the questionnaire at T1, in order to explore these factors within the wider sample). Second, exploration of NoMad responses offers participants the opportunity to reflect on their answers, and may therefore elicit amendments to, or qualifications of, the original NoMad responses. Exploring the prevalence of these events within a subsample therefore offers the opportunity to explore the integrity of questionnaire responses in a manner not possible through standalone survey method. This may also be useful for exploring congruence between beliefs and attitudes on the one hand, and actions and experiences on the other. For example, if a participant strongly/agreed with the statement ‘I am aware of reports about the effects of screening and treatment for malnutrition’, they would be asked questions such as: ‘Which reports are you aware of? How have these affected your perception of screening and treatment for malnutrition?’ (see online additional file 7, interview guide sheet). Given that NPT focuses primarily on individual and collective action (that is, the work that people have to do as individuals and within collectives in order to enact and embed a new set of practices), semistructured interviewing offers an opportunity to ensure that this is explored. Using the sampling frame described above, the researcher (MB) will aim to interview the maximum number of participants within the time and resource constraints of the project (approximately 15–20 interviews per observation point). Study participants will become eligible for interview 7 days after completion of the questionnaire instrument. Staff within the target population will often have irregular shift patterns and demands on their time and resources. Therefore, it may be necessary to make multiple attempts to arrange their participation. Once eligible for approach, the researcher will send an initial email inviting the participant to arrange a time for the telephone interview. If a reply is not received within 3 days of sending, the researcher will initiate a follow-up system by telephone, limited to two call attempts per day up to a maximum of eight calls, with attempts made between 9:00–17:00 hours on working weekdays (if available, an answerphone message will be left after the fourth call (only one message will be left in an eight-call cycle). Interviews will be arranged for a date and time convenient to the participant, and will be expected to last approximately 20–40 min. A reminder text message (or an email if a mobile telephone number not available) will be sent 24 hours in advance of the interview. Interviews will be audio recorded and transcribed for analysis. The process above was designed in consultation with area matrons within the business unit, in order to balance between the ability of the study team to follow-up participants, with a limit on the number and frequency of approaches, in order to avoid inadvertently placing extra pressures on participants. The study will also involve PDDG participants, in order to explore how concerns relevant to implementation were integrated into the development and delivery of the procedure and training. The findings relating to ICT/OPMH participants will be made available to the PDDG after initial implementation (immediately following completion of T1 data collection). This arm of the study will explore how information relevant to implementation was used in further development of the procedure and training. This will involve observation of team conversations and meetings (both in person and via email), follow-up telephone interviews to explore individual members’ experiences prior to implementation of the training and 6 months thereafter. PDDG participants will be recruited via team meetings, with prior arrangement for researcher (MB) attendance. Procedures for recruitment will be identical to those for ICT/OPMH participants (as described above). Four participants will be eligible as PDDG members, and we anticipate both 100% participation and no attrition from this group. Email discussions relating to development and implementation of the procedure will be collected across the period of the study (through group members copying the researcher into email discussions), as well as researcher (MB) observations in team meetings, and related documentary evidence (eg, meeting notes, action plans and so on). This information will be used to investigate how challenges relating to implementation and embedding of the new procedure were encountered, understood, negotiated and managed by PDDG participants. PDDG participants will take part in a semistructured telephone interview, lasting approximately 40–60 min, prior to implementation of the training (T0) and again 6 months following implementation. The researcher (MB) will explore if and how different aspects of implementation (derived from NPT components) were integrated into the design of the new procedure and training (see online additional file 2 for PDDG research questions; see online additional file 8 for the PDDG interview guide sheet). Questionnaire responses will be collected via paper instruments, which will contain no personal information. Audio data from interviews will be collected using digital dictaphones. Observation data will be collected and stored electronically. All study data will be stored securely on Bournemouth University (BU) servers, in password protected folders to which only the project team will have access (files will be transferred to BU servers, and deleted from dictaphones, as soon as possible following data collection). For transcription, files will be sent using a secure drop off-service, to a transcription service with which the study team will have a confidentiality and non-disclosure agreement. Exemplary quotes from interviews may be used in publications and other outputs. Where such material is used, quotes will be anonymised in order to remove detail that could identify specific patients or healthcare staff. No unanonymised data will be made available to anyone outside of the study team. Through interviews and focus groups, the study team will have access to the following personal data: proper names; job/role titles and details of practice. These data may identify individuals involved in the study, and the following procedures will be put into place to ensure anonymisation, as well as appropriate and lawful use and storage of this information. Respondents will be identified in transcripts by the participant identification number assigned to them once they have consented to participate. In addition, the content of quotes taken from the transcripts will have the following data removed, and replaced with a generic identifier (eg, patient/healthcare staff/individual site names - replaced with (patient A/nurse A/site A). This will ensure that the quote is communicated accurately, while preserving anonymity. Where age details are given, these will be expressed as 5-year intervals (eg, ‘76 years old’ becomes ‘75–79 years old’). Other details such as: specific morbidities; ethnic, cultural, religious, sexual orientation or gender assignment details, will be considered on an individual basis. If the information presents a risk of likely identification of an individual patient or healthcare staff member, the detail will be changed to a more generic form (eg, a more generic disease category for a specific diagnosis). No patient or public involvement was undertaken, as the study was a process evaluation of professional behaviour change involving HCPs. The purpose of the study here described is to understand processes that may promote or inhibit successful implementation and longer-term embedding of the new procedure and associated training. The majority of prior studies have focused on screening and treatment of malnutrition in hospital settings, and with comparatively fewer focusing on other institutional contexts such as care homes. The present study therefore presents an opportunity to explore and report on, the challenges and contingencies that may accompany process evaluation research in community settings. Potential challenges and limitations, as well as contributions of the study here described, are discussed below. Conducting mixed methods research in community settings presents a number of associated challenges. The work of ICT/OPMH means that available time for participation in study activity can often be restricted, and changeable at short notice. In addition, while ICT/OPMH teams share the same general areas of responsibility, structure and resource constraints may vary between teams, and also within teams at different times. Email as a communication method has been indicated by contacts within the trust as potentially unsuitable for this group, due to intermittent availability of time for response, and variable use of this system within the target population. Face-to-face contact at team meetings, through prior arrangement with team leads, will therefore be the primary method of recruitment and questionnaire data collection. With respect to interviews, the study has also been designed to maximise flexibility in participation by using a telephone calls, which can easily be rescheduled if needed and do not require additional travel or resources (eg, a meeting room). The voluntary nature of participation (that is, only staff wishing to participate will do so, and thus only these staff will be eligible for interview) has the potential to produce a biased sample. This bias may skew the sample towards those motivated to participate, either through positive regard for the intervention, or desire to voice critical views in relation to it (or current practice). To date, no results indicating psychometric validity of the original NoMad measure have been published. Our adapted survey, based on NoMad, will be piloted with non-dietetic HCPs who are also members of the INSCCOPe PDDG, in order to explore the clarity and face validity of questions across respondents. Due to time and resource constraints, we are unable to conduct further psychometric tests, and so bias relating to construct validity relating to ‘screening and treatment’, which incorporates both a relatively simple (screening) and more complex construct (treatment), may be present in the results. In addition, it will not be possible to predict likely response or attrition rates, due to a lack of available data to support this activity. It is unlikely that data saturation (that is, the point at which no further significantly different findings are found) will be reached in the telephone interviews, as this would require involvement of a much larger sample (likely to be >50% of the target population) than is possible with the resource constraints of the current study (this limitation has been noted in previous implementation studies— – see31 Bamford et al 31). It is therefore possible that the interviews will not exhaust the findings relevant to the areas in focus. The use of interview data to generate additional questions to be added to the questionnaires at T1/T2 time points, will however allow us to explore more widely the extent of issues identified in the interview subgroup, within the overall study sample. Previous studies have shown that interventions with demonstrated efficacy can be impeded by factors that vary across different settings,17 29 and that understanding of factors which may promote or inhibit implementation and embedding (eg, staff turnover, changes in working relationships, variable workload and resource constraints) is therefore crucial. For example, previous work using NPT in assessing implementation of nutritional guidelines in care home settings has demonstrated how findings can be used to drive ongoing development of the intervention (ie, by contrasting ‘real’ (observed) and ‘ideal’ (desired) conditions as a basis for generating specific service development actions).31 In the present study, findings from T0/T1 will be fed back to the PDDG after completion of T1, in order to inform further development of the procedure with respect to implementation. It is expected that resulting actions will be undertaken prior to T2, and that data from this observation point will indicate the impact (or lack thereof) of these developments. While the current study focuses on implementation within a single business unit of one trust, a longer-term goal is to rollout the new procedure to other areas of the trust. This will involve teams and settings with different organisational and logistical constraints, and findings from the study here described may be used to inform implementation in these settings. Implementation of new procedures within community settings is an issue not only with respect to nutrition, but for many other aspects of healthcare provision for older people within this space. The project offers an opportunity to generate methodological insights into conducting process evaluations using this approach in community settings, and thereby inform future study designs. The study will therefore add to the wider knowledge base, both empirical and methodological, with respect to understanding implementation in healthcare. The study team would like to acknowledge the support of the Burdett Trust for Nursing, and of staff within Southern Health NHS Foundation Trust for their help and support in the development of this study. WHO. What is malnutrition? 2016 http://www.who.int/features/qa/malnutrition/en/ (Accessed 29 Sep 2017).
. Combating malnutrition: recommendations for action. Russell J Bertrand Russell Arch 2009:1–7.
. Screening for malnutrition in sheltered housing. A Report from BAPEN with the Group on Nutrition in Sheltered Housing (GNASH). Br Assoc Parent Enter Nutr 2009.
. Living on a low income in later life. 2011. NICE. Nutrition support for adults : or oral al nutrition support, enter enteral al tube feeding and parenter parenteral al nutrition. 2006.
. The cost of malnutrition in England and potential cost savings from nutritional interventions (full report) A report on the cost of disease-related malnutrition in support in adults. 2015.
. A review and summary of the impact of malnutrition in older people and the reported costs and benefits of interventions. 2013:1–30. MAG. The ‘MUST’ explanatory booklet. 2011. NHS England. Guidance – Commissioning Excellent Nutrition and Hydration. 2015;2015:29. Wessex Academic Health Sciences Network (AHSN). Older People’s Essential Nutrition (OPEN) Eastleigh Project. 2016 http://wessexahsn.org.uk/projects/60/older-people-s-essential-nutrition-open-eastleigh (Accessed 29 Sep 2017).
. Developing and evaluating complex interventions: new guidance. 2007.
. The New Sociology of the Health Service. 2009:143–60.
. NoMAD: Implementation measure based on normalization process theory. 2015 http://www.normalizationprocess.org/resources/ (accessed 21 Aug 2017). Normalization Process Theory. How to use NoMAD? http://www.normalizationprocess.org/nomad-study/how-to-use-nomad/ (Accessed 14 Aug 2018).
. Qualitative researching: SAGE Publications, 2002.
. Basics of qualitative research: techniques and procedures for developing grounded theory: SAGE Publications, 2014. Contributors JM, KW and KS devised the project (for which CRM also provided advice). JM and KW obtained funding. JM managed the study as chief investigator. MB was primarily responsible for study design and protocol, with input from JM, KW, KS and CRM. All authors contributed significant revisions to drafts of the manuscript, and have read and approved the final manuscript. Funding The project is funded by The Burdett Trust for Nursing. Ethics approval Ethical approval for the study has been granted through institutional ethical review (Bournemouth University); NHS Heath Research Authority approval (IRAS ID – 223214) was granted on 05/04/2017. NHS Research Ethics committee approval was not required for this study, as it involves only staff. Study findings will be disseminated through publications in peer-reviewed academic journals, presentations to professional conferences and study reports to be provided to the Burdett Trust for Nursing.